I am on a roll of easy, as few steps as possible recipes these days. Between moving yet again to a new place, finding my steps in a French speaking town, going back to school to learn a new trade and not breaking my neck in the ice and snow outside, I am tired. But tired or not, supper time rolls in about the same time everyday and kids need to be fed. Husbands as well for that matter. And since I refuse to turn to takeout or mac and cheese on a daily basis, here is another easy family favorite that comes together super fast and easy. Serve with a good salad and you are done. Place 2 cups of rice in a bowl and top with water. Set aside. 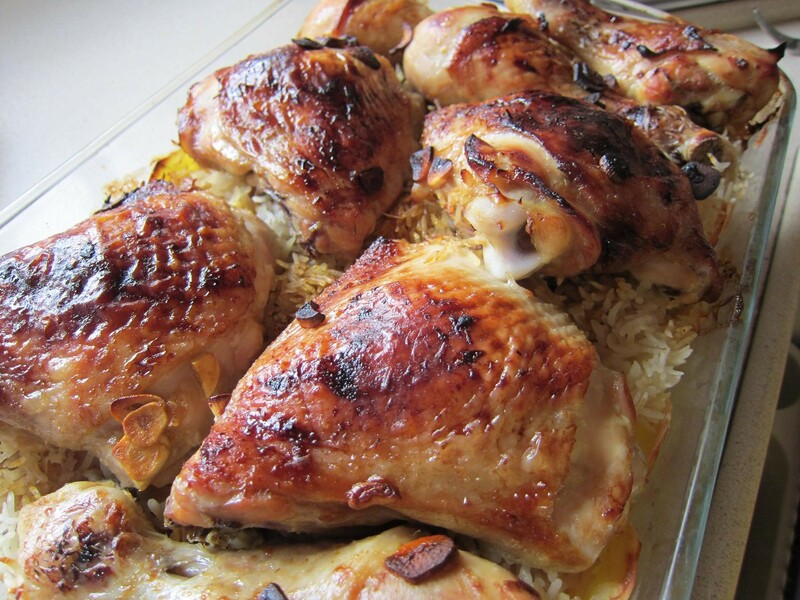 Mix 10 chicken drumsticks or thighs with 2 Tbsp oil, 1 Tbsp paprika, 1 Tbsp garlic (chopped fresh or dry), salt and pepper. Feel free to switch it up with any of your favorite spices. Place drained rice In an oiled (I use spray ) large casserole or baking dish, mix with 1 cup frozen veg (whatever floats your boat) and salt. Top with 3 cups boiling water or chicken broth. Mix. Place chicken on top. Cover and bake for 1 hour. Take cover off and cook for another 15 min.